Copernicus Publications recently launched its full-text HTML workflow and optimized the FR website for mobile devices. Thereby, the user experience is significantly enhanced when reading FR articles. Christian Klug, Torsten Scheyer (both from the University of Zurich), and Johannes Müller (MfN) joined the editorial board. Since Copernicus Publications took over the publication of Fossil Record in 2014, all articles were published with author's copyright and distributed under the CC BY 3.0 licence. Now, also the back volumes are distributed under this license. Fossil Record (FR) has received the new DOAJ Seal which recognizes journals with an exceptionally high level of publishing standards and best practice. In cooperation with the TIB|AV-Portal FR authors can now add short, citable video abstracts and video supplements to their articles. Fossil Record (FR) has become a member of the Committee on Publication Ethics (COPE) and thereby subscribes to the principles of COPE. Fossil Record (FR) has been added to the Directory of Open Access Journals (DOAJ). 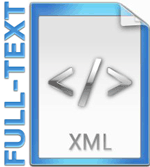 Fossil Record (FR) has started an XML-first workflow and will provide all new articles in full-text XML from now on.